If you’re good with Gouda, pleased with Parmesan or happy with Havarti, this is the day for you: National Cheese Lovers Day is January 20. If you’re not vegan, paleo, lactose intolerant or avoiding dairy, we have plenty of recipes you can try to celebrate the day. Consider Skillet Creamy Broccoli Mac and Cheese, Creamy Goat Cheese Polenta with Garlicky Kale & Lentils, Make-Ahead Cheese Ball, or One-Bowl Gluten-Free Carrot Cake with Cream Cheese Frosting. 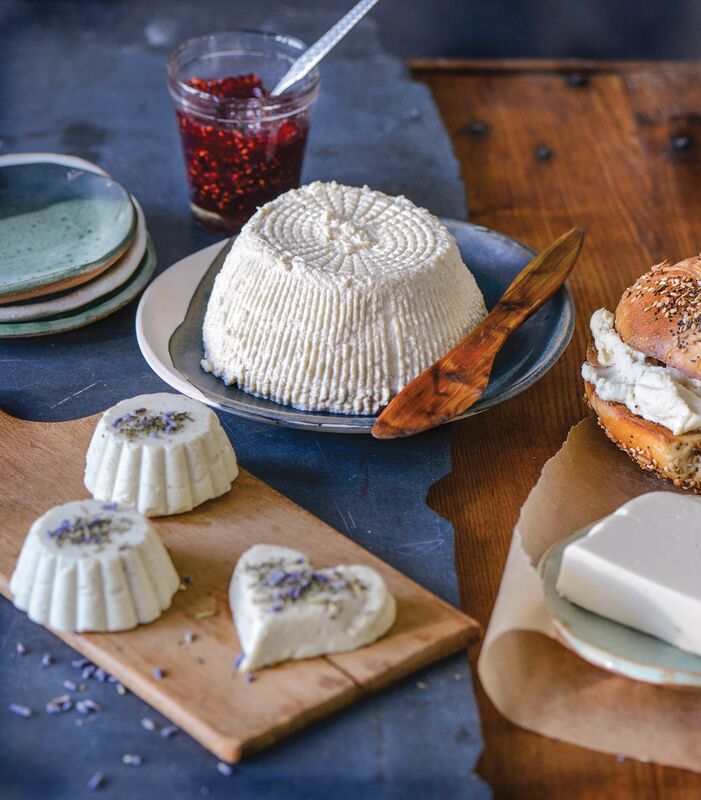 However, if dairy-free cheese is the way you choose to celebrate, here are four recipes that incorporate dairy-free cheese, taken from One-Hour Dairy-Free Cheese by Claudia Lucero (Workman Publishing, 2019), which goes on sale next month. The cookbook uses nuts, seeds and vegetables to keep the rich flavor and luscious texture of traditional dairy-based cheese, while staying free from the top eight allergens. For more resources on eating dairy free, check out the books Eat Dairy Free: Your Essential Cookbook for Everyday Meals, Snacks, and Sweets and Danielle Walker’s Against All Grain: Meals Made Simple: Gluten-Free, Dairy-Free, and Paleo Recipes to Make Anytime. If you’d like more information on the benefits of going dairy free, click here. Ricotta is often the unsung heroine of the US cheese world, but it’s truly a miracle of Italian resourcefulness. The dairy version is actually a by-product of cheesemaking. Once a hard cheese is made, the whey is reheated to draw out the whey protein so that it is not wasted. That is whey ricotta. This version has all the fluffy richness without the dairy. If you’re not sure you like ricotta, think of some of the delicious, iconic dishes that would be lost without it: lasagna, cannoli, white pizza. . . . The fact that ricotta is mild makes it a versatile starting point and blank canvas for traditional and nontraditional dishes. Need to add protein to a salad, roasted veggie dish, or even pancakes? Reach for ricotta! Nutritionally, this is a welcome far cry from the Velveeta-based “queso” (not pronounced as in Spanish but rather, k-so, with a Southern drawl if possible) I first tasted in Austin, but that American-style decadence is still there in flavor. I hope it makes your Tex-Mex dreams come true, but as the recipe title says, this also doubles as an awesome mac ’n’ cheese sauce. Send a Tex message. 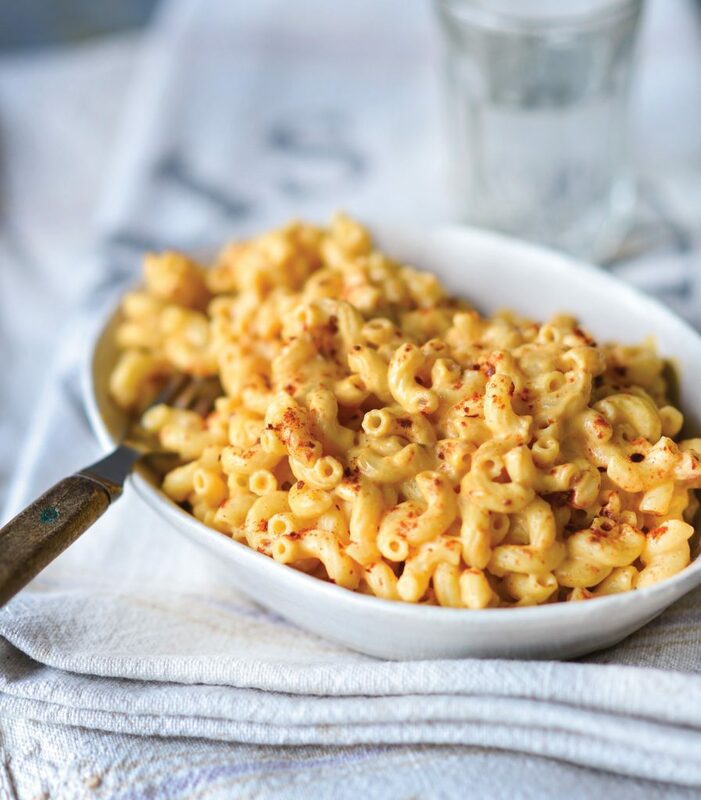 You might think this is a new-fangled way to use cauliflower instead of macaroni, but Cauliflower Cheese is a traditional, well-loved British dish. Much like a gratin, it is usually baked for a while in a casserole dish. 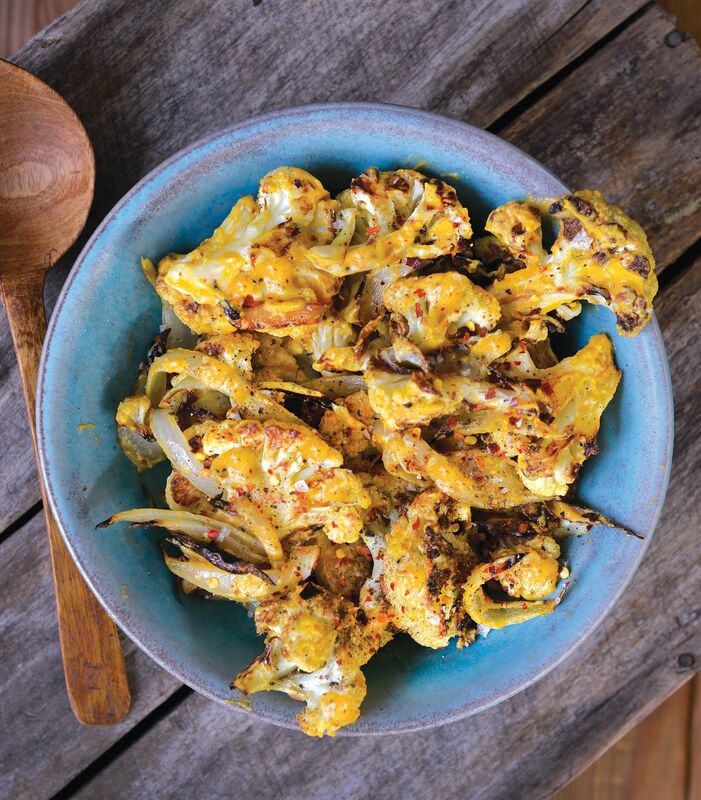 You can certainly do that, but I like the extra flavor gained by roasting the cauliflower first. Get your crisp on. 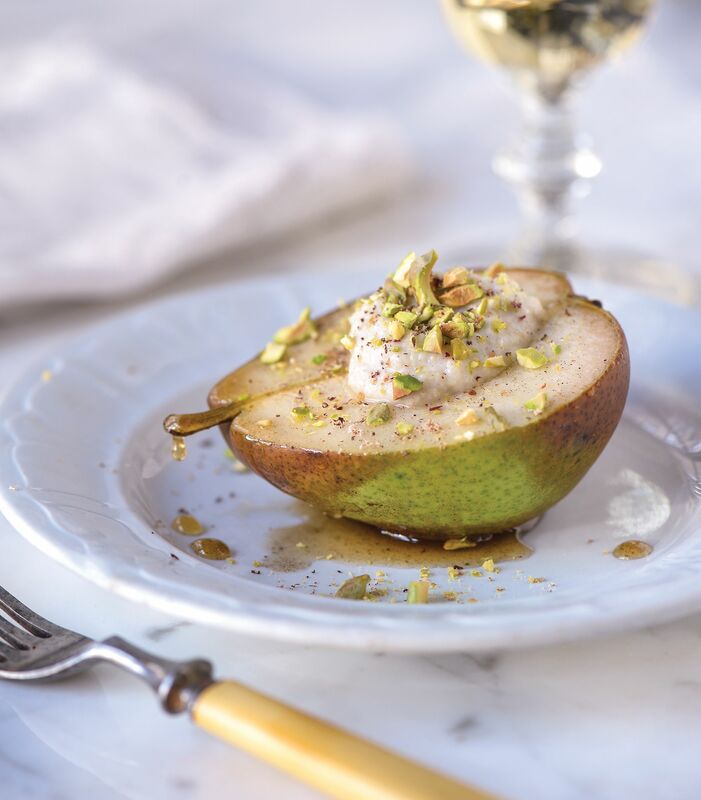 Confession: Pears are not my favorite fruit when served fresh, but when baked, mmm—they really transform! Not to mention, in this recipe, we’re mixing up a sweet ricotta cream similar to the ricotta and mascarpone cream in cannoli. Also, to claim some regional pride: Did you know that Oregon and Washington produce eighty-four percent of the United States’ pears? It’s the climate, volcanic soil, and mountain water! Pears also bake surprisingly fast compared with apples, so this dessert is beautiful, delicious, and easy-breezy. A perfect pear. Recipes excerpted from One-Hour Dairy-Free Cheese: Make Mozzarella, Cheddar, Feta, and Brie-Style Cheeses—Using Nuts, Seeds, and Vegetables by Claudia Lucero (Workman Publishing). Copyright © 2019. Photographs by Matthew Benson.